Over the past few decades, weblogs have widely made their way into English as a foreign language (EFL) teaching and learning. Despite this growing research on the educational values of weblogs, the impact of individual differences on students' perception toward blogging has been rarely explored. In an attempt to fill this gap, the present case study reports on the impact of individual differences on 28 BA level, Physics, Chemistry, and Biology major students' perceptions of English writing practice in blogosphere. Data was collected from participants' responses to a post-course written interview. Adopting qualitative and quantitative data analysis procedures, it was observed that English language proficiency significantly influenced students' perceived effectiveness of writing practice in the classroom blog. The findings of this study offer several practical implications for research on weblog-enhanced language learning. Over the past few decades, Web 2.0 technologies including weblogs have widely made their way into English as a Foreign Language EFL teaching/learning contexts (Ducate & Lomicka, 2008; Godwin-Jones, 2003). During this period, the potential of weblogs for promoting English writing practice has sparked interests among educators (e.g. Arslan & Sahin-Kızıl, 2010; Ducate & Lomicka, 2008; Miceli, Murray, & Kennedy, 2010; Vurdien, 2013; Ward, 2004). As websites for keeping personal diaries, blogs provide learners with an opportunity to discuss and share ideas, plans, and thoughts (Wang, Lin, & Liao, 2012). Despite the abundance of research findings on the benefits of blogging for knowledge construction and writing practice (Alm, 2006; Bloch, 2007; Godwin-Jones, 2003; Miceli, Murray, & Kennedy, 2010; Sengputa, 2001; Vurdien, 2013), empirical data on how students perceive this experience remains scant. Even fewer are studies that have explored the issue from the viewpoint of FL learners (Arani, 2005; Miceli et al., 2010). As Sengputa (2001) suggested, without understanding the impact of web-enhanced pedagogy from learners’ viewpoint, EFL educators cannot adequately investigate the educational potentials of this mode of learning. Success in technology-enhanced language learning, in other words, is crucially connected to how students perceive this experience (Alastuey, 2011; Wiebe & Kabata, 2010). In fact, “previous studies suggest that individual differences are important antecedents of beliefs about using information technology” (Wang, Lin, & Liao, 2012, p. 140). Hence, individual differences may significantly contribute to students’ perception of blogosphere and their educational experience in the space. 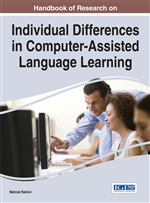 In an attempt to shed more light into this under-investigated area, the present chapter reports on a semester-long case study in two General English (GE) courses in a state university in Tehran, Iran that sought to explore the impact of individual differences on EFL learners’ perception of English writing practice in blogosphere. To contextualize and clarify the possible impact of individual differences on students’ technology-enhanced writing practice, after a brief review of weblogs, their features, research on the application of this technology for writing practice, learners’ perception, and the role of individual differences this process, the chapter will focus on the results obtained from the aforementioned case study. Computer Literacy: Is the basic knowledge of how to apply different technologies for personal or professional purposes and encompasses fluency in and comfort with using computers and keyboarding which should also encompass the knowledge and skill to evaluate and adapt new educational technologies as they emerge. Proficiency Levels: Encompass students’ knowledge of a particular language and might range from very limited knowledge and skills referred to as ‘low proficiency’ to more sophisticated levels of knowledge and competencies widely referred to as the intermediate and/or advanced levels. Student Perceptions: Also known as beliefs and attitudes refer to learners’ positive and/or negative viewpoint of a particular topic, namely in the field of education. Weblog: Also contracted as blog, a website that provides users with an opportunity to keep an account of their thoughts and ideas and share it with authentic audience on the web. Individual Differences: Stand for different variables ranging from gender and educational background to perceptions and proficiency levels that leave an explicit or implicit impact on individual’s behavior. Blogfa: Refers to a Persian free weblog hosting platform that supports both Persian and English languages and allows users to add or embed hyperlinks and multimedia. CALL: Computer assisted language learning stands for a well-known and growing profession with a special attention to applying different digital technologies for teaching and learning different languages.